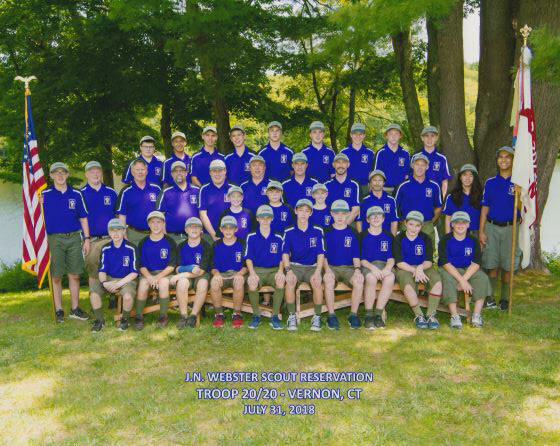 Welcome Troop 20/20 to the 2018-2019 scouting season! This is our troop's 39th year in scouting. Each year our troop grows in membership, activities and friendship. This year promises to be a great one. Our Troop will have one senior patrol and additional patrols yet to be determined. A Leadership Corps will also be formed and will be responsible for planning all Troop meetings and activities. Interested in joining Troop 20/20? Whether you're a Cub Scout looking to move up to Boy Scouts or new to scouting, please contact us or stop by a meeting. Troop 20/20 has developed the following "Ten Commitments" as guidelines for our scouts to follow in and out of the troop. I will strive to live up to the ideals of the Scout Oath and Scout Law, practice the scout slogan and embrace the scout motto. I will continuously look for opportunities to provide cheerful service for all that I come in contact with. This includes being the first to volunteer when needed and never being the last. I will make eye contact when spoken to, speak with the sufficient volume to be heard and provide a coherent response. I will be considerate of other people’s feelings and sensitive to their needs. This will be accomplished by always asking myself; “How would I like to be treated in this situation?" I will respect the scout uniform, wearing it proudly and wear troop 2020 attire where appropriate. This includes all scout related activities and while traveling. I will not be rude to fellow scouts, adult leaders or others in the community. I will not use inappropriate language, be late to scout functions or ignore scout and adult leadership directions. Being respectful includes not harming fellow scouts (hands off) or animals and plants in the environment. I will learn and practice all the skills that scouting has introduced me to. I will respect the property of others, troop equipment and community property. I will also take responsibility for all of my personal gear and not blame others for losing track of it whereabouts. I will never use the words “I can’t”, “it’s not my job” or “I don’t want to”. Becoming an Eagle Scout that my troop can be proud of is my ultimate goal.